The Junicode font is designed to meet the needs of medieval scholars; however, it has a large enough character set to be useful to the general user. It comes in Regular, Italic, Bold and Bold Italic faces. The Regular face has the fullest character set and is richest in OpenType features. Both the selection and design of the characters in Junicode reflect the needs of medievalists. However, many persons writing in ancient and modern languages have found the font useful. If you wish to see better support for any language, please leave a request at the Junicode project page (http://sourceforge.net/projects/junicode). 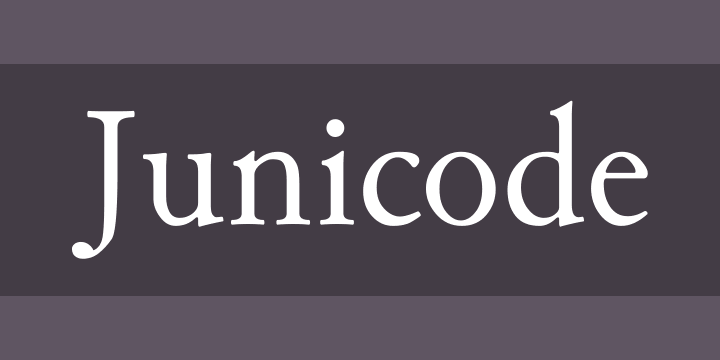 Junicode implements most of the recommendation of the Medieval Unicode Font Initiative (version 3.0). Look for special MUFI char- acters (those not in the Unicode standard) in the Private Use Area (U+E000 and above). Download the complete recommendation at http://www.mufi.info/. Junicode is licensed under the SIL Open Font License: for the full text, go to http://scripts.sil.org/OFL. Briefly: You may use Junicode in any kind of publication, print or electronic, without fee or restriction. You may modify the font for your own use. You may distribute your modified version in accordance with the terms of the license.